Holidays/clothing reconstruction. Well the holidays went by in a blur. We prepared the house, cooked, got everything ready for family to arrive. Only had 6 for Christmas, but we had a great time. 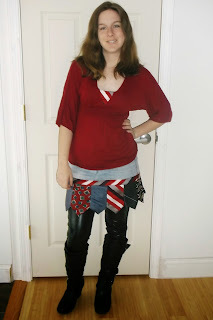 I worked on some clothing reconstruction slightly before Christmas and after before my youngest daughter went home. Yesterday also. 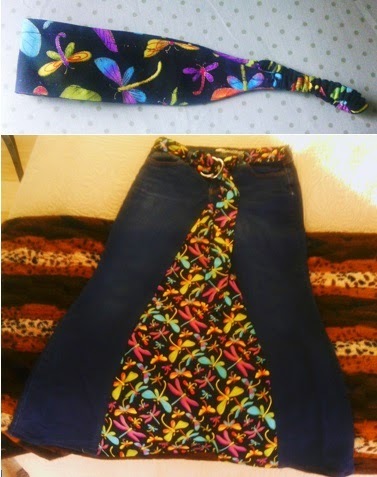 First, I worked on a jean maxi skirt for my oldest daughter. I wanted it to look like it had been a skirt all along instead of a pair of jeans masquerading as a skirt. So I chose some fabric that went with the colors of the jeans, straightened the inseams, and made a matching belt and headband. I used one tie for a piece of the skirt extension, the trim and the triangle that made the sweater more discrete. For my husband, I decided to patch the knees of his jeans. I wanted a patch that actually looked good, so I checked out some shapes that I could make the right size and would fit him. As he is an ECU pirate, I chose a skull. He always wears out his right knee, so two pairs of pants got a right knee patch. 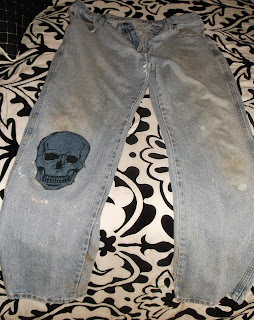 For a more complete list of my clothing reconstruction projects, check out my pinterest page here. It's on the clothing reconstruction maximized board.